After reading the Ulterior Epicure's treatise on the Reading Terminal Market in downtown Philly, we were giddy with anticipation that our meeting with the RDA would place us within footsteps of the very place included on his 2008 Best of Show list! It might be a tourist trap at other times but at lunchtime the place is packed with office workers and locals lining up for some delicious eats. 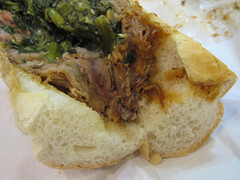 We joined them, eager to try the pulled pork with greens from DiNic's and the Italian hoagie from Salumeria. 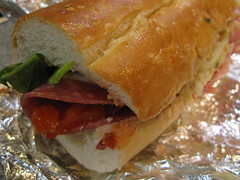 It's true that good sandwiches can be found in NYC but man can those Pennsylvannians make a good hoagie! We could have stayed all day sampling wares. As it is, we left wearing huge grins lasting well into the early evening. yayayayy!!! i love the pictures of you two munching down! YUM!! Hi ladies, thrilled to hear you had an excellent food adventure at the Reading Terminal Market. Next time, stop for a buttered pretzel.